BC Place is a multi-purpose stadium located at the north side of False Creek, in Vancouver, British Columbia, Canada. It is owned and operated by the BC Pavilion Corporation (PavCo), a crown corporation of the province. It is currently the home of the BC Lions of the Canadian Football League (CFL), Vancouver Whitecaps FC of Major League Soccer (MLS) and the annual Canada Sevens (part of the World Rugby Sevens Series) as well as the BC Sports Hall of Fame. 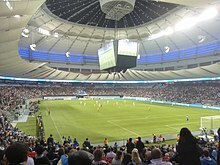 The stadium also served as the main stadium for the 2010 Winter Olympics and 2010 Paralympics which Vancouver hosted, as well as a venue for multiple matches including the championship match for the 2015 FIFA Women's World Cup. The stadium opened on June 19, 1983, and was built as an indoor structure with an air-supported roof, the largest of its kind in the world upon its opening. Following the 2010 Winter Olympics, BC Place was closed for 16 months as part of an extensive revitalization, the centrepiece of which was replacing the inflatable roof with a retractable roof supported by cables. Once construction was completed, the stadium's new roof was also the largest of its type. Construction of the stadium started in 1981, with Dillingham Construction contracted to build the stadium, designed by architecture firm Studio Phillips Barratt, Ltd. BC Place was built as part of the preparations for the 1986 World's Fair, Expo 86. Upon its completion in 1983, the stadium was the world's largest air-supported domed stadium until May 4, 2010 when it was deflated for the last time in preparation for the erection of its new retractable roof, designed by structural engineers Geiger Berger Associates. Its original air-supported design was similar to the Hubert H. Humphrey Metrodome in Minneapolis, Minnesota, which was home to both the Minnesota Twins Major League Baseball team and the Minnesota Vikings National Football League team. The stadium held its grand opening on June 19, 1983. The first major event held in the stadium came the next day, June 20, 1983, when the Vancouver Whitecaps hosted the Seattle Sounders in a North American Soccer League game with attendance announced at 60,342. On June 23, 1983, the BC Lions played their first game at the new stadium, a preseason 41–19 victory against the Calgary Stampeders with 53,472 in attendance. A month later, on July 24, 1983, a crowd of 41,810 watched the BC Lions defeat the Saskatchewan Roughriders 44–28 in the Lions' first regular season game at the stadium. The venue would host the Soccer Bowl '83 later that year. On September 18, 1984 Pope John Paul II addressed an over-capacity crowd for "A Celebration of Life". The celebration was part of the papal visit to the Archdiocese of Vancouver. It was one of the most heavily attended events in the stadium. The Pope's Celebration of Life was followed a few months later by the Canadian Pacific Billy Graham Crusade, which drew similar numbers each night. The stadium was then used for the opening and closing ceremonies of the 1986 World Exposition on Transportation and Communication (Expo '86). Accepting an invitation by the Province of British Columbia, their Royal Highnesses Prince Charles and Princess Diana made themselves available to take part in the opening ceremonies. To great fanfare, they officially proclaimed the World's Fair open on May 2, 1986. In 1987, an exhibition match of Australian rules football was played at the stadium and drew a crowd of 32,789 – a record for the largest AFL/VFL crowd outside of Australia. The stadium also held an NFL exhibition game in 1998 when the San Francisco 49ers beat the Seattle Seahawks 24–21 in the American Bowl. On January 5, 2007, snow accumulated on the air-supported Teflon Fibreglass roof, despite strict zero accumulation of ice guidelines and ice accumulation structural warnings. The accumulation caused a tear in the roof's ETFE-coated fabric close to Gate G on the south side where the roof meets the top of the concrete bowl. The tear grew quickly as air escaped through it, whereupon maintenance staff performed an intentional, controlled deflation to protect the integrity of the roof's intact fabric panels. As it was designed to do, the deflated roof rested on its steel support cables 6 metres (20 ft) above the seating and the field. Normally, the roof had a rise of 27 metres (90 ft) above the top of the bowl when inflated. No one was injured during the incident, although rain and melted snow flooded the bowl and subsequently had to be pumped out. An independent report indicated that an accidental rapid pressurization combined with lightly gusting wind and a location of previously undetected damage caused the tear. The damaged panel was replaced with a temporary one on January 19 and the roof was re-inflated. The BC Contractors Association held an exhibition in the stadium over the week of January 23, during which the roof leaked in several places when it rained. The temporary panel was successfully replaced with a permanent one in June 2007, just prior to the start of the 2007 CFL season. On May 16, 2008, it was announced that over $150 million in major renovations would be carried out on BC Place Stadium. The work was done in two phases. The first phase involved upgrades to seating, washrooms, concessions, and luxury suites, as well as the reinforcement of the existing ring beam at the top of the building and was completed in October 2009, in time for the 2010 Winter Olympics. Work on the retractable roof began in May 2010, with PCL Westcoast Constructors Inc. contracted to construct the roof designed by architecture firm Stantec Architecture Ltd. and structural engineering firm Geiger Engineers, with Schlaich Bergermann & Partner serving as consulting engineers and Genivar, Inc. acting as services engineers. Geiger also designed the stadium's new centre-hung scoreboard. The roof's construction began immediately after the completion of the 2010 Winter Paralympics and the final deflation of the air-supported roof. The official budget for the completed Phase 1 upgrades plus the revitalization project was $514 million. The new roof, a cable-supported retractable roof system first used with the Commerzbank-Arena in Frankfurt, Germany, is the largest of its kind. The opening measures 100 by 85 metres (109 by 93 yd), the same size as the field below. The fabric roof retracts into and is hidden by a pod in the centre of the opening, above the suspended videoboard. The updated stadium also features the second largest centre-hung high definition scoreboard in North America, after the one in the Dallas Cowboys Stadium (since renamed AT&T Stadium). In addition, a new artificial turf developed by Polytan was installed at an estimated cost of $1.2 million. It is designed to achieve FIFA 2-star certification, the highest rating possible. The soccer pitch is 117 by 75 yards (107 by 69 m). TSN analyst and former CFL player Chris Schultz praised both the design and engineering of the new stadium. Columnist Brian Hutchinson has praised the renovations for significantly improving the acoustics, and providing a bright and airy feel to the stadium. These were aspects that were missing in its previous air-supported roof incarnation, as well as the Montreal Olympic Stadium and the Rogers Centre (formerly SkyDome). The artificial turf installed between September 2011 and April 2015 drew criticism, notably its lacklustre characteristics for playing professional level soccer. A new artificial turf was installed in May 2015, prior to the FIFA Women's World Cup Canada 2015. The total cost of the turf upgrade was $1,327,000, with Canada Soccer and Rugby Canada contributing $500,000 CDN to the project. Liam Middleton, Canada's Rugby Sevens coach, stated that the new surface was "better than some natural grass surfaces they've played on." New retractable roof is the largest cable supported retractable roof in the world. Revolving doors replaced with clear glass doors, which allows the stadium to be accessed much more easily. Old brown glass around building replaced with light green glass which lets more light in and makes stadium brighter. BC Lions locker room completely expanded and refurbished: Old lockers were taken out, sanded down, refinished, and put back in. New cubicles were also put in with individual lighting for players. Locker room also sports a new floor called "sport floor". New synthetic turf, called Polytan LigaTurf RS+, was installed as the new playing surface. Turf has a 1 1⁄4 inches (32 mm) thick shock pad underneath the turf and special eco-friendly BionPro infill. A centre-hung high-definition scoreboard measuring 68 by 38 feet (21 m × 12 m). Around the stadium is a new 51 inches (1.3 m) electronic ribbon board, with a circumference of 2,200 feet (670 m). Added 1,140 new HDTV screens. Screens work through a system called Stadium Vision. Each screen runs on a separate video source, allowing menu boards at concourse concession stands to show game updates to fans as they order from concession stands. All concourses widened and refurbished. Added 140 additional portable concession stands. Storage of food and supplies will be in concession stands. 50 fully refurbished private suites and 1,300 newly refurbished premium Club Seats. Wheel chair seating now at every price point and level of the stadium. New upgraded washrooms, and access ramps with new lighting. New state of the art sound system. New wider seats: seats or 20 inches (51 cm) wide with cup holders on every seat. New sport lighting in stadium; 10% of lighting is called hot strip lighting. Hot strip lighting gives instant on and off. The opening and closing ceremonies of the XXI Olympic Winter Games and the opening ceremonies of the X Paralympic Winter Games were also held in BC Place Stadium in February and March 2010, respectively. The stadium was the first air-supported structure and 24th venue to host the opening ceremonies of the Winter Olympics. 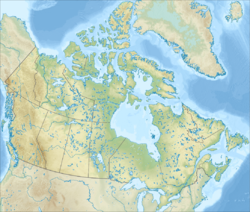 It was also both the third CFL venue and the third Canadian venue to have served as an Olympic Stadium, after Montreal's Olympic Stadium and Calgary's McMahon Stadium. The 47th Vanier Cup was the first Canadian university football championship paired with the Grey Cup Festival and played Friday, November 25, 2011 between the McMaster Marauders and Laval Rouge et Or in front of 24,935. Nicknamed "Best Game... Ever", it is widely regarded as one of the most exciting Canadian Football games of all time with McMaster winning 41–38 in double overtime. It was the first championship played in the newly renovated facility. The 2012 CONCACAF Women's Olympic Qualifying Tournament final between the United States and Canada played at the stadium was the highest attendance for a women's CONCACAF Olympic Qualifying game with 25,427 people in attendance. The 2014 NHL Heritage Classic took place March 2, 2014 in BC Place, with the Ottawa Senators facing off against the home team Vancouver Canucks. It was the first of the NHL's "outdoor" games to be played in what technically is an indoor stadium, albeit one of a larger capacity than a typical NHL arena. BC Place hosted its second major international sports competition, the 2015 FIFA Women's World Cup. Five group stage matches, two round of 16 matches, and one quarterfinal match were held in the stadium during June 2015, and the final championship match between Japan and the United States was played here on July 5, 2015. The stadium hosted round six of the HSBC World Rugby Sevens Series 2015–16 series. Currently, BC Place's main sports tenants are the BC Lions of the Canadian Football League (CFL) and Vancouver Whitecaps FC of Major League Soccer (MLS). The stadium was also home of the Vancouver Whitecaps of the North American Soccer League (NASL) during the early 1980s. The Vancouver Nighthawks, a member of the World Basketball League, played the 1988 season at BC Place. Soccer Bowl '83 was also held at BC Place, where the Tulsa Roughnecks defeated the Toronto Blizzard 2–0. When it was built, the floor of BC Place was too small to accommodate a full-sized CFL regulation field, as a result BC Place became the first CFL stadium to use a 20-yard end zone instead of the regulation 25-yard end zone then in use. Although controversial at first, the smaller end zone proved highly popular with players and was adopted league-wide in 1986. The stadium has hosted the CFL's championship game, the Grey Cup, nine times: in 1983, 1986, 1987, 1990, 1994, 1999, 2005, 2011, and 2014. Notable was the 1994 championship, in which the hometown BC Lions defeated the U.S. expansion team the Baltimore Football Club on a last-second field goal by Lui Passaglia, preventing the Grey Cup trophy from leaving Canada (Baltimore would win the Grey Cup the following year). The stadium hosted the 99th Grey Cup in 2011 after the new roof was completed (this Grey Cup game was also won by the BC Lions at home). The stadium is also built to accommodate a baseball diamond, with retractable seating sections making room for right field. The Vancouver Canadians of the Triple-A Pacific Coast League played several series of games there between 1984 and 1988, including games 1 and 2 of the 1985 league championship series. Numerous Major League Baseball spring training games were also played, including in 1984 (Toronto Blue Jays and Milwaukee Brewers), 1986 (Chicago Cubs, San Diego Padres, Montreal Expos and Seattle Mariners), 1993 (Toronto, Seattle, Milwaukee and Detroit Tigers) and 1994 MLB season (Toronto, Seattle, Montreal and Colorado Rockies). The stadium is served by two SkyTrain stations via the Expo Line and Canada Line: Stadium–Chinatown to the East, and Yaletown–Roundhouse to the West. The False Creek Ferries and Aquabus also serve the stadium, docking at the nearby Edgewater Casino. ^ "Whitecaps expand lower bowl capacity at B.C. Place to 22,120". March 4, 2016. Archived from the original on May 9, 2016. ^ a b c "BC Place Stadium – Tensile Membrane Structures Sample Application". Makmax.com. Retrieved January 24, 2013. ^ "Vancouver's History". vancouvertourism.com. Retrieved May 30, 2012. ^ Cyganiak, Marcus. "Vancouver Skyline to Change Forever – BC Place Deflated for Good". Buyric.com. Archived from the original on March 30, 2012. Retrieved September 30, 2011. ^ Fudge, Simon (September 13, 2011). "Whitecaps and Sounders raise the curtain on BC Place back in 1983". WhitecapsFC.com. Retrieved July 30, 2014. ^ "CFL Results June 23, 1983 Calgary 19 @ BC 41 on CFLdb Statistics". stats.cfldb.ca. Retrieved January 3, 2018. ^ "Remembering the thrill of when BC Place first opened". CFL.ca. September 30, 2011. Retrieved June 24, 2016. ^ "Lakeland Ledger – Google News Archive Search". Retrieved December 30, 2016. ^ Phillips, Randy (August 28, 1978). "Tulsa captures Soccer Bowl with dull victory over Blizzard". The Gazette. p. D-5, D-8. Retrieved March 17, 2015. ^ "B.C. Place Stadium's inflated roof collapses (05/01/2007)". CTV.ca. January 5, 2007. Archived from the original on April 7, 2010. Retrieved September 30, 2011. ^ Sun, Vancouver (January 5, 2007). "The roof at B.C. Place stadium deflated after tear (05/01/2007)". Canada.com. Archived from the original on June 28, 2011. Retrieved September 30, 2011. ^ "Vancouver Sun – The roof at B.C. Place stadium deflated after tear (01/05/2007)". Canada.com. January 5, 2007. Archived from the original on November 11, 2011. Retrieved September 30, 2011. ^ "Structural Engineering Slide Library – Modern domes: Air-supported dome". Nisee.berkeley.edu. Retrieved September 30, 2011. ^ "Human error a factor in BC Place roof trouble". January 13, 2007. Archived from the original on June 28, 2011. Retrieved December 23, 2011. ^ "Teflon roof of B.C. Place Stadium reinflated". CTV.ca. CTVglobemedia. January 19, 2007. Archived from the original on December 22, 2008. Retrieved January 19, 2007. 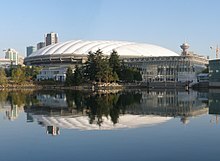 ^ "Stadium dome returns to Vancouver skyline". Canadian Broadcasting Corporation. January 19, 2007. Archived from the original on January 21, 2007. Retrieved January 19, 2007. ^ "B.C. Place's reopening marred by leaking roof". Canadian Broadcasting Corporation. January 24, 2007. Retrieved September 30, 2011. ^ "BC Place Permanent Roof Panel Installation" Archived July 4, 2007, at the Wayback Machine, BC Place Stadium press release, June 14, 2007. ^ a b Ansell, Lauren. "Northern Light". Stadia Magazine. Retrieved May 30, 2012. ^ "FACTSHEET: BC Place Budget | BC Newsroom". Newsroom.gov.bc.ca. January 18, 2013. Archived from the original on February 19, 2013. Retrieved January 24, 2013. ^ "Local MLS bid still on, investor says". The Vancouver Sun. Retrieved June 8, 2012. ^ a b Hutchinson, Brian. "Finally, B.C. Place is a Retractable-Roof Stadium That Works". National Post. Archived from the original on July 16, 2012. Retrieved May 30, 2012. ^ "The New Stadium – BC Place". Bcplacestadium.com. Retrieved December 23, 2011. ^ a b "Schultz: Renovated B.C. Place among world's best stadiums". The Sports Network. October 3, 2011. Retrieved December 23, 2011. ^ "Toronto FC set to open anticipated ninth season". Toronto Sun. Retrieved July 31, 2015. ^ "Robbie Keane slams unacceptable BC Place pitch". CSN. Retrieved July 31, 2015. ^ "New surface selected for BC Place". whitecapsfc.com. Retrieved March 27, 2015. ^ Johnston, Patrick. "Canada Sevens day one live blog". The Province. The Province Newspaper. Retrieved March 12, 2016. ^ "Suites and Club Seats – BC Place". Bcplacestadium.com. Retrieved December 29, 2011. ^ "BC Place | Vancouver Whitecaps FC". Whitecapsfc.com. Retrieved December 29, 2011. ^ "Accessibility – BC Place". Bcplacestadium.com. Retrieved December 29, 2011. ^ TSN presents complete coverage of 48th Vanier Cup. Tsn.ca (November 20, 2012). Retrieved July 26, 2013. ^ "'One of the greatest games' ever seen". TheSpec. Retrieved December 1, 2011. ^ MacMahon, Martin. "Canada no match for USA". Sportsnet. Retrieved January 30, 2012. ^ "FIFA Women's World Cup Canada 2015™ - Vancouver". FIFA. Retrieved July 31, 2015. ^ "HSBC World Rugby Sevens Series 2015–16: Schedule, calendar fixtures and results". The Daily Telegraph. March 7, 2016. Retrieved March 14, 2016. ^ nurun.com. "B.C. Place's roof facing its last days | Vancouver 24 hrs". Vancouver.24hrs.ca. Retrieved January 24, 2013. ^ O'Brien, Steve (November 2005). The Canadian Football League: The Phoenix of Professional Sports Leagues (Revised Edition): The Phoenix of Professional Sports Leagues. ISBN 9781411658608. ^ "BC Place overhaul earns stadium award". The Vancouver Sun. Archived from the original on May 20, 2012. Retrieved October 26, 2012. ^ "NCSEA Awards Program". NCSEA. Retrieved October 26, 2012. ^ "2012 Canadian Consulting Engineering Awards Press Release" (PDF). ACEC. Retrieved October 26, 2012. ^ "Global Best Project Winner Sports/Entertainment: BC Place Revitalization". Engineering News-Record. Retrieved June 3, 2013. Wikimedia Commons has media related to BC Place.